Anyone who knows me well, knows I love my snacks. Most Indian snacks are deep fried. Actually, scratch that, most snacks anywhere are deep fried. Well, atleast the yummy ones are. That being the way it is, I try to cut down on these kinds of snacks. Which means, I'm constantly on the lookout for healthier options. And it goes without saying that even these healthier options, have to be delicious. At the end of the post, I will list some of the recipes that I find healthier. Do you love your snacks as much as I do? Hit me up with your healthy snack recipes in the comments section. I would love to try them out and will post my experience here, with credit to you, of course. Today's post is one such snack option. Kale Chips. I never thought I'd love it as much as I do. I've had the option to cook with Kale only in the last couple of years. I've not tried too many Kale recipes so far. Just this Skillet Breakfast Hash and now these Kale Chips. I've made them both a few times and we love them. 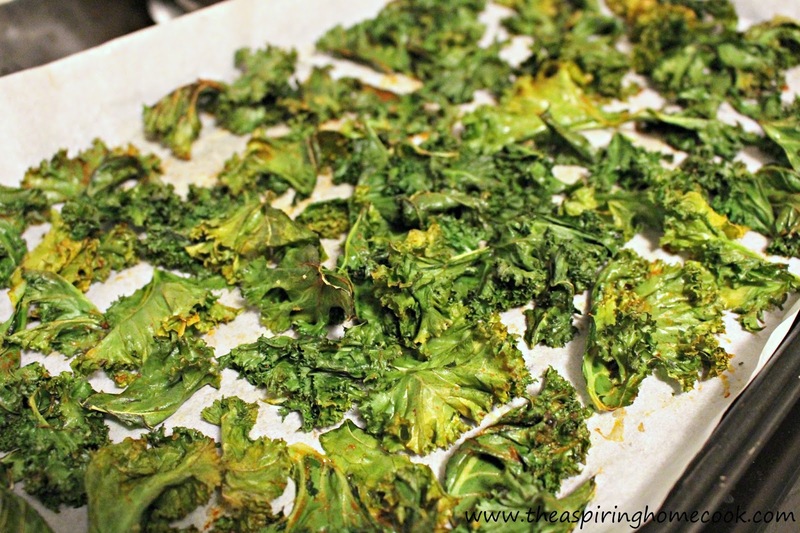 That is how I knew, I had to share these Kale Chips with you. Kale is really good for you. They are choc full of antioxidants. These are baked and I can't tell you how delightful they are to snack on. You have to try it to believe it. What I love is that the options for the seasonings are endless. I have a soft spot to this Spicy Masala Chaat Seasoning. It is a little tangy, a little salty and a little spicy - just perfect. And its such an easy recipe too. All you do is prep the leaves, sprinkle the seasoning over, toss and bake. So what are you waiting for? Try it out. You'll definitely want to make it again. 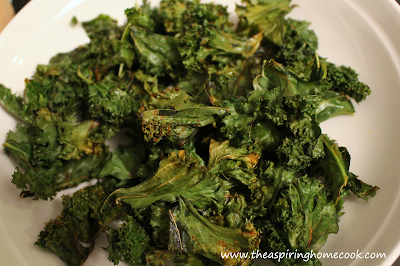 To prep the Kale leaves, break the leaves into smaller chip size portions, discarding the tougher stem. In a small bowl, mix the olive oil, the chilli powder, chaat masal and salt together. 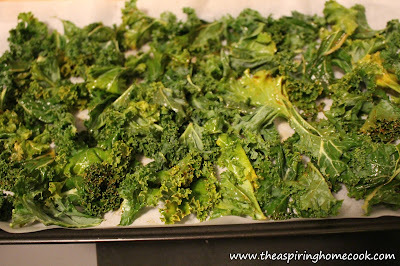 Drizzle this over the the kale leaves and toss well to make sure all the leaves are coated with the spices. Its best to do this with your hands. Rub the leaves gently to get the seasoning in the little nooks and crannies. 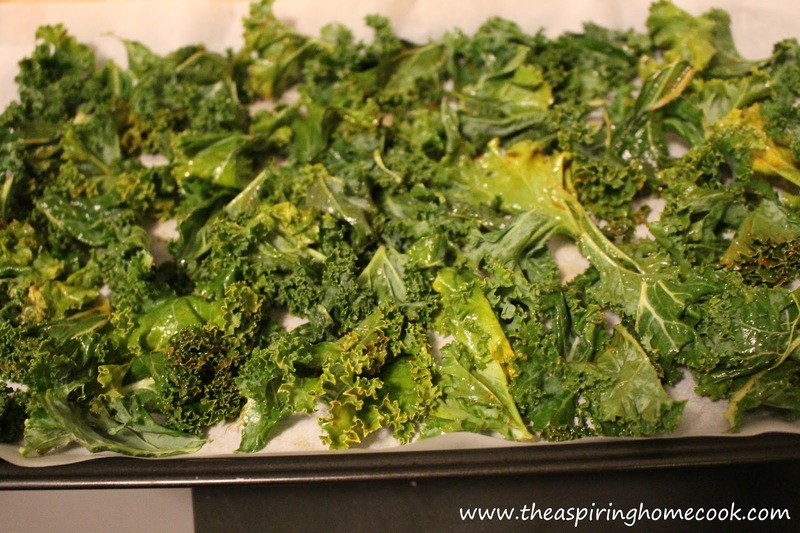 Arrange the kale leaves in a single layer on the tray. Bake for 10-15 minutes or till the leaves are lightly browned. Keep a close watch on the leaves as they can go from just right to burnt very quickly. Take them out of the oven and let the chips cool completely before eating. They crisp up as they cool. Pin now and enjoy later! We love Kale Chips and this is a great recipe! Thanks so much for sharing with us at Full Plate Thursday. Hope you have a great week and come back to see us real soon! Thanks for stopping by Miz Helen.